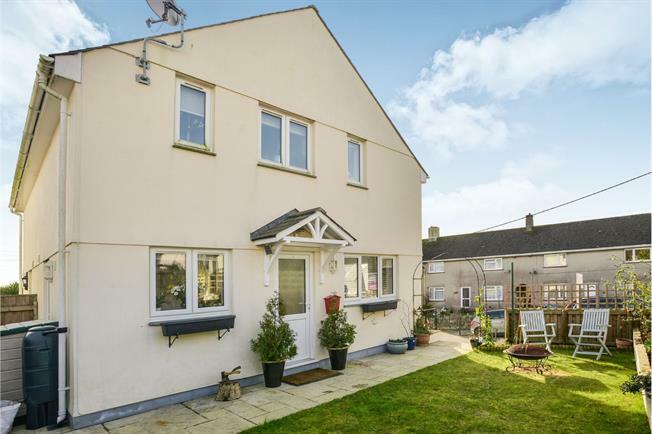 2 Bedroom Semi Detached House For Sale in Yelverton for Guide Price £160,000. FEATURED IN THE BIG OPEN HOUSE This two bedroom modern semi-detached property is in excellent condition throughout. Accommodation comprises of beautiful open plan Living/ Dining/ Kitchen across the ground floor and a utility room, two good size bedrooms and luxurious bathroom. Outside the garden is landscaped and enclosed, as well as parking for two and a garage. The Open Plan room incorporates living/ dining and kitchen areas. Living/Dining room 13'3 x 13'2. With double aspect uPVC windows to front and side, radiator, staircase to first floor. Kitchen 9'7 x7'6 uPVC window to side, uPVC door to rear. The Kitchen is fitted with a range of matching wall and base units, sink and drainer, four ring hob, with built in oven and extractor fan. Space and plumbing for dishwasher, space for fridge. Space and Plumbing for washing machine and tumble dryer, wall and base unit. Side aspect window and Veluxe window, radiator. Enclosed bath with tiled surround and fitted shower, wash hand basin, low level WC, heated towel rail, built in storage cupboard. A enclosed landscaped garden with sun terrace, driveway with parking for two, Garage/ workshop situated beneath the property, featuring built in workbench and storage cabinets.